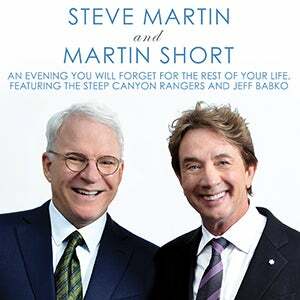 Live Nation presents STEVE MARTIN and MARTIN SHORT "An Evening You Will Forget for the Rest of Your Life" featuring THE STEEP CANYON RANGERS and JEFF BABKO live at Red Rocks Amphitheatre August 6, 2018. Reserved tickets are $59.50, $84.50, $129.50 and $179.50 plus applicable service charges. Longtime comedians Steve Martin and Martin Short will play a one-night only show at the Red Rocks Amphitheatre Theatre Aug. 6. The show, "An Evening You Will Forget for the Rest of Your Life," includes stand-up, film clips, musical numbers and conversations about their lives in show business. Martin and Short will also be joined by the Grammy-winning Steep Canyon Rangers, the bluegrass band with which Martin frequently performs. Tickets go on sale Friday at AXS.com.